Product #18300 | SKU CUE-D75 | 0.0 (no ratings yet) Thanks for your rating! Features; lightweight design and a in-built D-Tap connector. 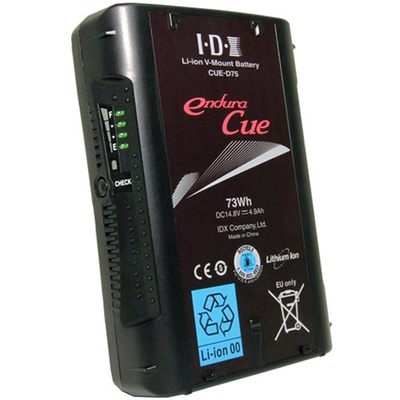 The CUE-D75 from IDX is the smallest of the CUE series and will appeal to users wanting a lightweight battery at an attractive price. Built to Japan’s stringent PSE regulations, the CUE series sets the standard for mechanical and electrical safety. An in-built D-Tap connector gives an additional option for powering ancillaries like LED lights.